Reinvent this French stew by giving it a dash of dark chocolate. This French classic, traditionally made with bacon, mushrooms and red wine, get a surprising twist with the velvety addition of dark chocolate in the recipe below. Your guests simply won’t get enough of this sumptuous, decadent version of tender beef and vegetables in a deep and hearty sauce. If you’re looking for a rustic stew that’s packed with both new and familiar flavours, look no further. While Knorr Demi Glace helps give this dish its tremendous burst of flavour, here’s a tip that can make your dish taste even richer. Tip video: Give your dish a tremendous burst of flavour! For a fuller taste, use pure chocolate with a high percentage of cacao. Top with shaved chocolate or use cacao powder for a signature look. Instead of red wine, you can use bouillon to deglaze your pan. Nutritional tip: Beef contains saturated fats. You can balance this by serving smaller portions. What chocolate is best for beef bourguignon? Use pure or unsweetened chocolate for a richer, more balanced sauce. What if I don’t have 3 or 4 hours to prepare the bourguignon? By using a pressure cooker, you can reduce the time to 45 minutes. For an authentic beef bourguignon, what other seasonal vegetables can I use? Root vegetables like celery and beetroot also work well in this dish. 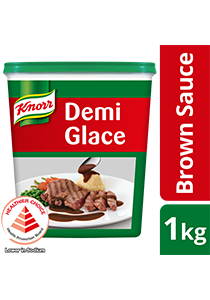 Knorr Demi Glace Brown Sauce Mix gives you the full flavour and aroma of beef in 5 minutes, instantly boosting the taste of your favourite dishes or scratch-made demi glace.